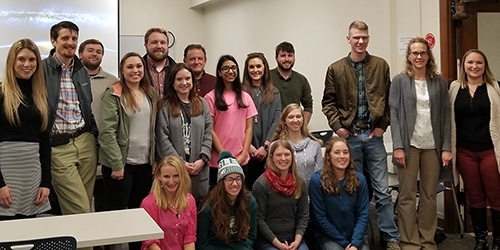 These graduate students and faculty members have been selected to take part in the STEM Professional Awareness, Advancement and Development program. Eighteen graduate students and four faculty members have been selected to take part in a new program. The STEM Professional Awareness, Advancement and Development program, or PAAD, is designed to help graduate students in the fields of science, technology, engineering and math prepare for future careers. The program has four tracks: academia, industry and commercialization, government and public policy and patent law. Each student selects a track and takes part in courses, activities and professional development opportunities designed by the faculty participants to familiarize them with the career possibilities in that area, and to help them develop the necessary skills to succeed. Caitlin Yoakum is a doctoral student studying biological anthropology. She explained that she was drawn to the program because she is interested in attending law school when she finishes her PhD. "I have worked with human remains and native groups and have a strong interest in learning how we create laws that focus on cultural ownership," she said. "I want to understand what we consider 'alien' and how we handle the remains of individuals after they are deceased with the utmost dignity." Yoakum explained that the PAAD program will give her the opportunity to explore the field of law while working on her doctorate. "It is expected, in my field in particular, to aspire to be a professor, but PAAD is meant to prepare us to use our academic backgrounds for careers that are considered unconventional," she said. "I am looking forward to gaining new mentors in the field of law and learning more about life outside of academia." Rick Wise, director of the microelectronics-photonics program, is one of the faculty selected to take part in the program. Wise explained that his background and his experiences led to his interest in the PAAD program. "As a first generation college student from a small town in Arkansas majoring in chemical engineering, it was not easy for me to visualize the concepts that I was being taught in real world applications," he said. Wise has seen the effects of introducing students to the real-world places where science and engineering skills are applied. "I have taken undergraduate students to Dallas each summer to visit companies in high tech industries," he explained "Several students have pointed to the awe they experienced while touring industry labs as being the Eureka moment when they made the decision to attend graduate school to perform research. After hearing about the PAAD program, I realized this would be an excellent opportunity to address a similar gap that I see in STEM graduate education. Many of our graduate students also are lacking this viewport into the complex and wondrous nature of real world product research, development, and manufacturing at the micro and nano scale." Wise is organizing trips for first year graduate students to meet with people working in their fields at high tech companies. He explained that his goal is to "help the students understand the prize so they will become more passionate about the race." The PAAD program will begin taking 2019 faculty applications this semester, and students can apply for the 2019 program in the fall semester. For more information on the program, email Cynthia Sides or visit nsfpaad.uark.edu. This material is based upon work supported by the National Science Foundation under Grant Number 1735204. Any opinions, findings, and conclusions or recommendations expressed in this material are those of the author(s) and do not necessarily reflect the views of the National Science Foundation.